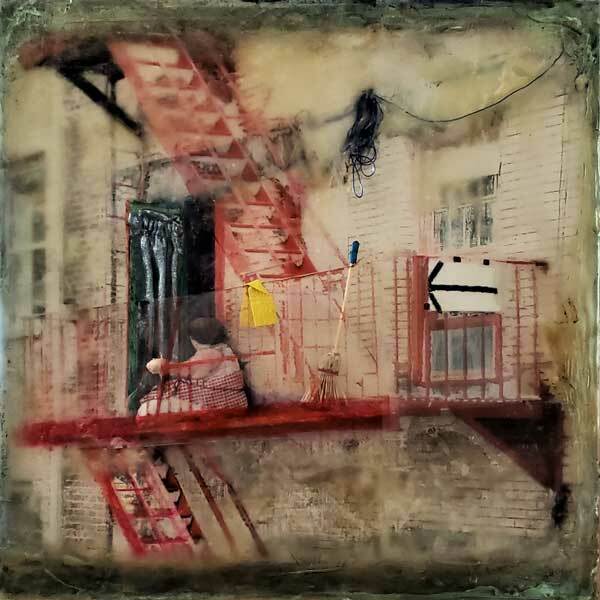 Kathy Moss-Reeves participated in Wherefore Art in Spring 2019 at Village West. Kathy Moss-Reeves is a Midwest transplant living on the East Coast. "As long as I can remember I've always been fascinated with detailed and complicated objects. It was an obsession to which I would deconstruct things, then attempt to reconstruct their forms. While my parents weren't too pleased with some of the outcomes of my curiosity, it wasn't until I was given an array of art supplies that I lost interest in taking the toaster apart to make a robot. To this day my work reflects my observations of the physical world, transformed through a reconstruction process involving multilayered techniques. I have a BFA, plus a Post-Baccalaureate degree in Art Education from UW-Milwaukee, as well as continued Master's credits at UW-Madison. Wisconsin Visual Artists (formerly Wisconsin Painters and Sculptors) accepted me as a member in 1984. My artwork has been exhibited in museums and galleries throughout the Midwest and internationally for the last 35 years including the Milwaukee Art Museum, Charles Allis Art Museum, Museum of Wisconsin Art, Anderson Art Center, Wisconsin Academy of Art Gallery, Springfield Museum of Art in Missouri, Elmherst Art Museum Illinois, and the Museum of Modern Art in Saitama, Japan." More information on Moss-Reeves and her work can be found at mossreeves.wordpress.com.